Corporate strategy should focus on an organisational redesign to mobilise the mind power of employees. Regular McKinsey Quarterly readers will recognise authors Lowell Bryan and Claudia Joyce from recent articles that have provided a foretaste of Mobilizing Minds. The book's preface indicates the writing occupied the last three years, but searching the McKinsey Quarterly reveals that the ideas and thinking have deeper roots, starting with articles by Bryan dating to 1993. The book argues that organisational innovations from the 1920s, designed to gain control of 19th century industrial organisations, are inadequate for companies operating in the 21st century digital, global economy. Research suggests that employees struggle to manage increased interactions and information overload (email, voice-mail, instant messaging and meetings) and that companies fail to share knowledge efficiently within their organisation. In a world where value is increasingly generated through intangible capital, corporate strategy should focus on organisational redesign to mobilise the mind power of employees and tap underused talent, knowledge, relationships and skills. Bryan and Joyce's model emerged from a study of the top 150 companies between 1970 and 2004. Using number of employees as a proxy for the internal complexity of the company, and profit per employee as a measure of profitability, they found that comparing the top 30 companies in an industry to the next 30 revealed a 'smoking gun'. The ability to create high profits per employee and to push back the complexity frontier lies within the companies themselves rather than in the industries in which they compete. The authors outline a new organisational model starting with a 'backbone line structure' to increase line management authority, supported by enterprise-wide standards and protocols. The model also demands 'one-company governance and culture', a 'partnership at the top', and 'dynamic management' to ensure attention to nurturing future value creating initiatives. This model pays significant attention to revamping financial reporting and performance-evaluation systems to encourage better economic behaviour. In the preface, the authors write that "economic changes in the last 15 years have been profound"; there is a case, however, for arguing that the impact of collaborative technologies in organisations goes back further. Furthermore, the latest generation of low-cost social collaboration tools known as Web 2.0 (blogs, wikis) has grown tremendously; yet it is not clear that the authors fully appreciate the scope of the impact on organisations. It's interesting to note too the companies cited as embracing components of their 21st century organisation. They are at pains to explain that differences in profitability are not based on industry, yet they choose a very narrow set of examples: Exxon Mobil, GE, IBM, Microsoft and Toyota are offered as illustrations of operating effectively as one company, while Chevron, Cisco, Microsoft, Samsung, and Total are identified as companies with highest net income per employee. 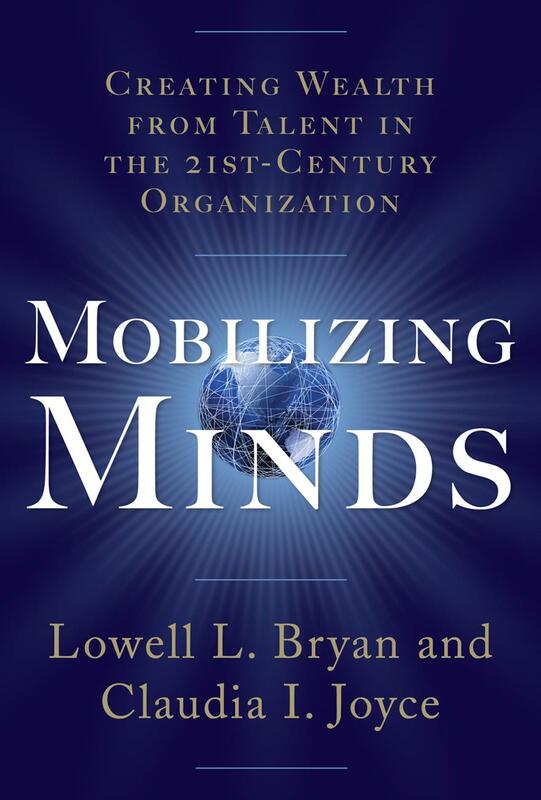 Bryan and Joyce credit an extensive team of "mobilizing minds" supporters, but I wonder if the book may be enriched with an even wider network. For instance, the open-source movement, especially the organisation behind Linux, is a visible example of the kind of structure advocated by Mobilizing Minds. It balances hierarchy with collaboration to create value, incorporating clearly established standards and protocols. Finally, issues around changing mindsets at all levels of talent in the organisation, and involving employees in organisational design, are mentioned throughout the book. Yet detailed attention to issues of "Hearts, Minds and Behaviours" waits until Chapter 11. Is this sufficient focus? Just as the authors underestimate the increasing impact of Web 2.0 tools on organisations and the urgency for change, they also seem to under-rate the importance of engaging talent 'hearts' within organisations as part of the process of mobilising minds. This solidly researched and considered book is a critical contribution to driving essential organisational changes for 21st century business success. The real value and potential of the book, however, will be released by mobilising minds around it, extending the network and perspectives on the issues raised and filling the gaps identified by the authors. - Mobilizing Minds: creating wealth from talent in the 21st century organization, Lowell Bryan and Claudia Joyce, McGraw-Hill, $29.95, ISBN: 0-07149-082-5. - Jenny Ambrozek is head of consultancy SageNet. She blogs about 21st century organisations at http://c21degrg.typepad.com.